With the warm, humid summer will follow an increase in bedbug numbers in the home around the Macclesfield area, therefore the requirement for a pest control for the removal of these vermin will be more called upon. They're not just found in beds, so use Town & Country Pest control for a professional, but affordable fumigation to rid you of these unsightly vermin. The common bed bug is the best adapted to human environments. 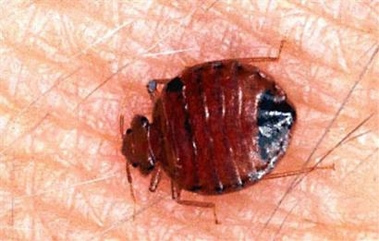 Small, nocturnal insects, bed bugs feed on the blood of humans, occasionally causing skin infections and scars when the bites are scratched. While bed bugs have been known to harbour pathogens in their bodies, including plague and hepatitis B, they have not been linked to the transmission of any disease and are not regarded as a medical threat. What your bed is made from will make no difference to whether you get bed bugs or not. Bed bugs are now becoming a huge problem within the UK, this is due to the increase of international travel. Beds are not the only harbour they will use, will easily make home behind electrical sockets, skirting boards anywhere to hide and keep out the way. Adult bed bugs are 4-5mm long and reddish-brown in colour. They appear flattened, oval, and are wingless Female bed bugs lay between 200-500 eggs over a two month period, and are able to reproduce all year round. The eggs are visible to the naked eye measuring 1 mm in length and are a milky-white tone in colour. The eggs hatch in one to two weeks, with the hatchlings beginning to feed immediately. They pass through five moulting stages before reaching maturity, requiring a feed during each of these stages. At room temperature, it takes about 5 weeks for a bed bug to pass from hatching, through to maturity, at which point they become reproductively active. Bed bugs are difficult to control, but good hygiene and cleansing will help to keep the bugs away. Town & Country Pest Control can conduct the intervention that is required to eradicate an infestation. This will be done with the use of a wettable powder that will be sprayed onto affected area and any neighbouring surfaces to stop any movement of bed bugs. Soft furnishings, bedding and any affected clothing will need to be laundered, sprayed or possibly destroyed.